If you all haven't noticed yet, I have a bit of a facial oil addiction. But the thing is, facial oils are just such amazing skincare products - they're literally packed full of wonderful ingredients without any sort of water or filler blocking you from effective results. So when I was given the chance to try an oil from the infamous brand Odacité I jumped at the chance. The brand is known for their incredible formulas, with an oil for just about every skin concern out there. I decided to try out an oil from their Private Collection called A Summer in Hossegor*, which works to face brown spots and reduce fine lines and wrinkles. The oil contains ingredients such as Wild Carrot Seed Oil, Organic Blueberry Seed Oil, Organic Papaya Seed Oil and Buriti Fruit Oil which are all ultra-potent oils that work to fight signs of aging. All of the ingredients are wonderful but I remember being especially intrigued by the Blueberry Seed Oil and Papaya Seed Oil which are both highly effective ingredients that you won't find in just any old oil. Blueberry Seed Oil is chockfull of antioxidants while Papaya Seed Oil is rich in a natural fruit enzyme called Papain, which prevents and eliminates brown spots while also dissolving any dead skin cells. The oil is thick and rich but never heavy - I've been using it at night, on alternating days with my Vintner's Daughter Botanical Serum*, and have been thrilled with the results I've already seen! One of my biggest skin concerns is my ever present acne scarring, which many products haven't even been able to make a dent in. Within a few weeks of using this lovely formula my skin is already looking significantly clearer, with my scars fading and my skin looking a heck of a lot more even toned. I've also found the oil to work well on minimizing new acne, while keeping my face incredibly hydrated. All in all the formula is just perfect, and couldn't be working better for my skin! 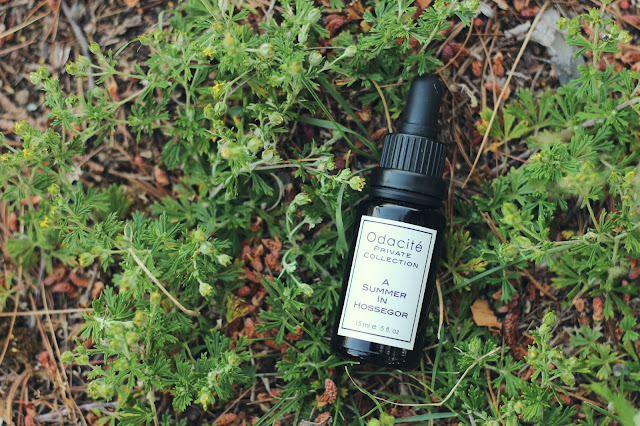 There's a reason that Odacité's oils are known as some of the best in the world - each of their formulas is given so much thought and consideration that when using it you get the feeling that it was made just for you. Everything about it is simply beautiful and I couldn't be happier. Have any of you tried an oil from Odacité. Any recommendations on which one to try next? Be sure to follow Odacité on their Twitter, Instagram and Facebook to keep up with all their latest! Soothing Skincare from TNB + a Giveaway!